Jack Heathcote, has his own interpretation of the “basement fish room” concept. 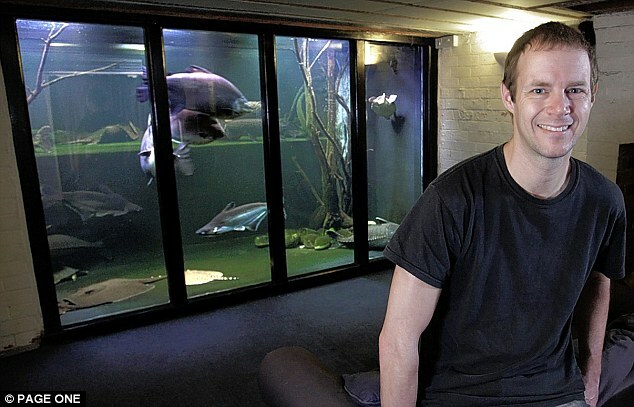 The 37 year old Nottingham resident has put together a 12’6″ x 12’8″ x 7′ “aquarium” (if you can even call it that) filled with exotic fish. “My hobby’s not only taken over my life, it’s taken over my home. But I love it!” says the salsa teacher, who has been infatuated with fish since a trip to a Blackpool aquarium when he was ten. This new construction, one-upped the one he had in his previous residence: an indoor tropical pond containing 12 stingrays. After selling his previous home, Jack and purchased this new house with the intention of turning the cellar into a giant tank. 3 of the walls are actually part of the foundation, while the forth wall was replaced by a large window. The tank hold approximately 4,800 gallons!! Jack performs 1,200 gallon waterchanges…..ummm….ouch. Even with a high-pressure hose it takes 6 hours to refill the tank. But how do you clean the glass? a huge mag-float? 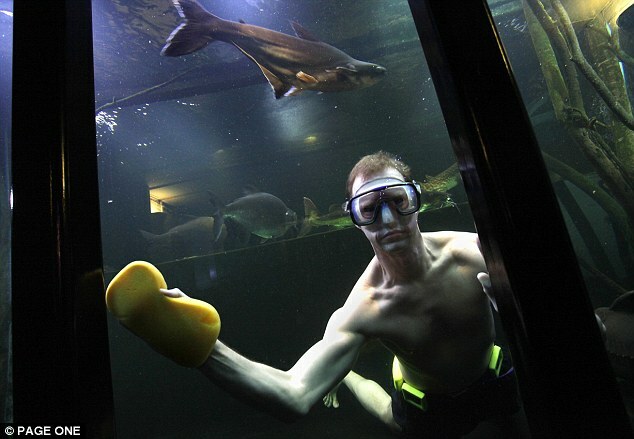 Nope, Jack actually dives into the tank and cleans it with a sponge. Jack feeds ones every 2 or 3 days, and uses anything from trout to mussles.